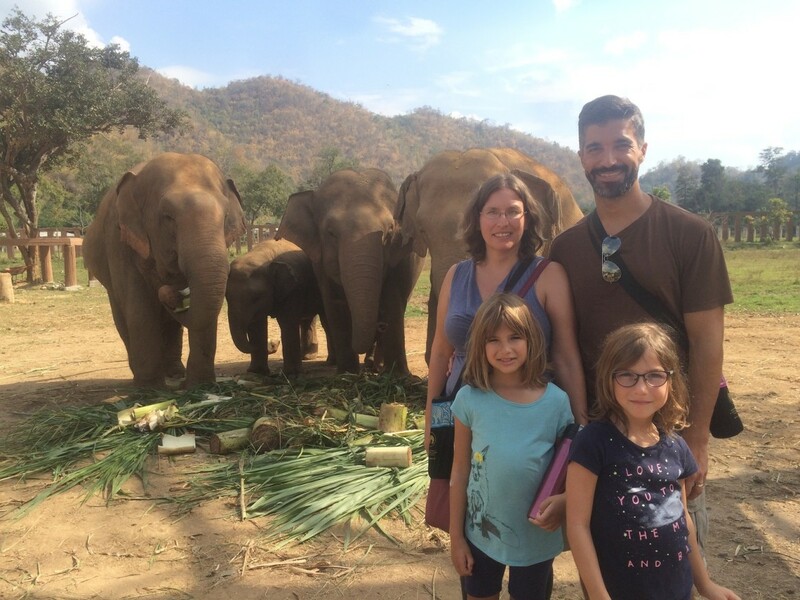 This family departed on a five-continent tour of the world with only a few months of planning. Our family includes myself, Sabrina, my husband, Anthony, our two daughters Hannah, 8, and Amy, 6, and our cats Sammy and Sacha. We are a Canadian family who relocated to Cupertino, California in 2012. On March 1, we returned home from a six-month trip around the world and a few days later the cats returned home from Grandma’s house in Toronto. In contrast to other families, this trip is not something we had been dreaming of for years. When the new year rolled around in 2015, my husband and I discussed what we’d like to do for the upcoming year. I believe we discussed traveling with the girls, but not anything concrete. It was just enough though, for my brain to continue working on it in the background. One day it just clicked that this would be the perfect time to travel around the world! I did some research, which included coming across Heather Greenwood Davis’s site ‘Globetrotting Mama’, talked to our landlady and my daughters’ doctors and school, and everything seemed to be lining up. In March, we made the decision to go for it and bought our plane tickets. The research and planning continued from there, as I mapped out our exact route. I tried to make the trip nature-oriented for the girls, while also including some big cities and historical sites for the adults. Other considerations included weather and budget. In the end, we traveled through Peru, Brazil, South Africa, Kenya, Australia, New Zealand, Malaysia, Thailand, India and Italy. While it was challenging being together 24/7 at times, the trip was definitely worth it. The girls were incredibly adaptable, particularly with sleeping in different places and taking different modes of transportation. My eldest just soaked everything up and was at the perfect age for the trip. Hannah has a social communication anxiety (Selective Mutism) related to school, so learning outside of the classroom was a huge benefit to her. She even got to spend time with her favorite animal—the elephant! My younger one turned 6 on the trip and had some emotional meltdowns along the way, although these would have happened even if we had stayed home. After four months of traveling Amy wanted to go home, but she soldiered on and enjoyed the extra cuddles from Mom and Dad. Her highlights included seeing cheetahs, scarlet macaws and cockatoos. My husband had to leave his job to take the trip, but was hired back upon his return. We knew his skills were in high demand and short supply, so it was a decision we were comfortable making. Since moving to the US, I have been at home with the girls, so the trip allowed me to get out of our little bubble (and the bigger Silicon Valley bubble) and meet new people, explore different places and have new experiences. We stayed in Airbnb as much as we could as a way to see how people live in other countries. One of the most interesting things for me was going from a country of one particular faith/cultural tradition to a country with different faith/cultural tradition. This was particularly true of the last four countries we visited, in which Islam, Buddhism, Hinduism and Catholicism were predominant. Since our return in March, we’ve been adjusting to life back in Cupertino. For my husband, this means getting used to long meetings again and settling into a new position in the company. For me and the girls, it means establishing a new routine, as I’ve decided to home school them for the remainder of the school year. While I enjoy the slower pace and not having to make school lunches, my brain is yearning for something more and I am turning my thoughts to re-entering the workforce. For now though, we’re just taking things one day at a time and enjoying the beautiful California weather! This is #1000families post number 205. Do you have a family story of your own to contribute to the 1,000 Families Project? Or do you know a family that might want to do so? Learn more about how the series got started and how to get involved here. You can find all of the #1000families posts here.